Escape to the peace of a forest cathedral—the fresh scent of pine, the rough, broken branches, the litter of crunchy cones—all protected by a thick, green canopy. Our Moss Pinecone collection transports your senses to the sacred stillness of virgin forest. 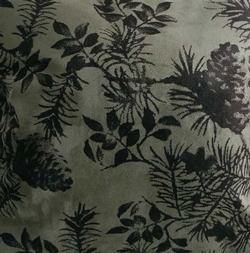 A dark brown pine cone design is printed on a sage moss green micro fiber suede on this rustic shower curtain. 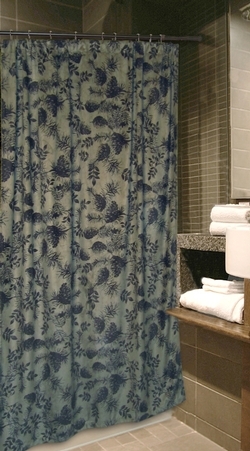 The Moss Pine Cone shower curtain can add a touch of nature to your room. Measures 72" W x 72" L with a button hole top.